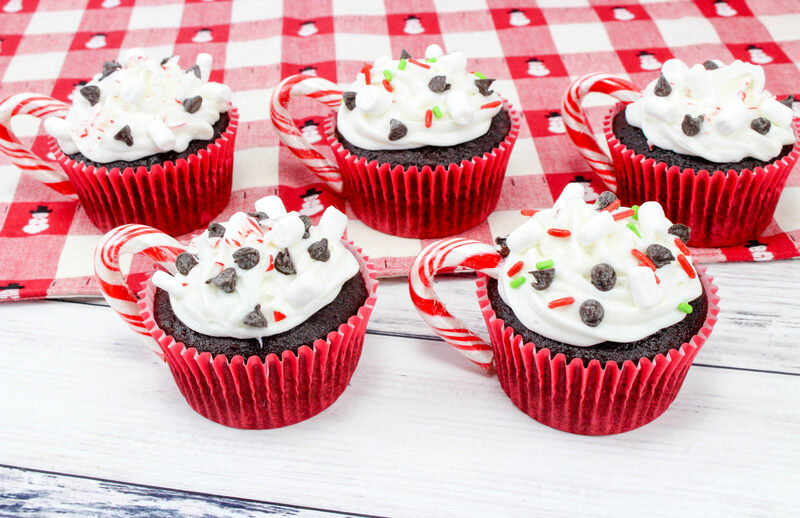 Wow your holiday guests with these Hot Chocolate Cupcakes! 1. Use a piping bag and tip to put a swirl of frosting in the middle of each cupcake to resemble whipped cream (or marshmallow fluff) on the top of hot chocolate. You can put a dollop with a spoon if you don’t have a piping bag. Just make sure to leave the edges of chocolate cake showing. 2. Sprinkle on some chocolate chips and marshmallows. 3. Take 2 of the candy canes and crush them into fine pieces. Take the other 6 candy canes and break or cut off about 2 inches of the straight end, so you have the entire rounded part left (Scissors actually work great to cut the candy canes). 4. Sprinkle a little of the crushed candy canes or Christmas jimmies on top of the frosting. 5. 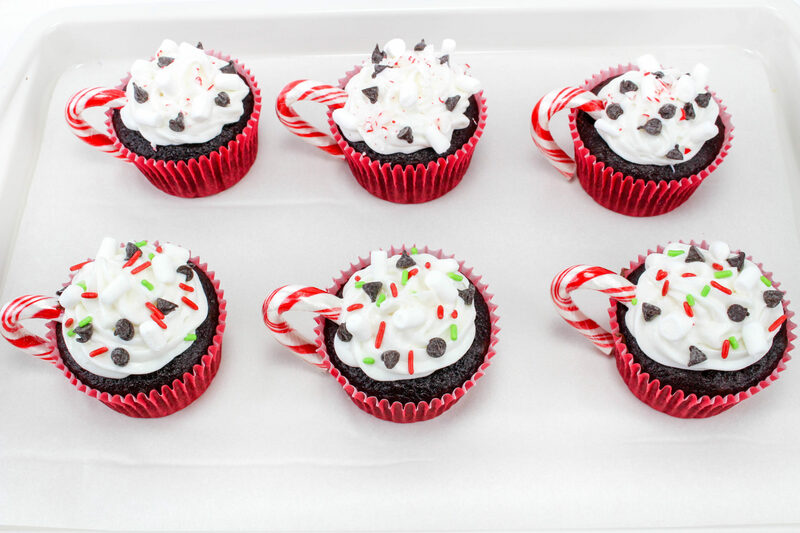 For the cup handle, hang one of the candy cane pieces onto the side of each cupcake. Press one end to the candy into the top of the cupcake on the edge and let it hang down on the side of the cupcake liner. 6. These cute little “cups of hot chocolate” are a great fun holiday treat! I am excited to make them for my family on Christmas. I know they are going to love them! Ok, so I have a question for you. Do you call it hot chocolate or hot cocoa? Obviously I am on team hot chocolate hence the Hot Chocolate Cupcakes, but I am curious what you call it. The cup handles are adorable and they really add a festive look to your cupcakes. I love how easy this is and these cupcakes are perfect for the holiday season. I’d actually love one for breakfast! Very cute name for the chocolate cupcakes with white frosting for whip cream and the chocolate chips sprinkled. You went over the top with the candy can handle. Woo hoo! You have combined the two best things in the world into one super treat! I can’t wait to give these a try. I would eat so many of these. I am big on cupcakes. My kids would like them too. They are really cute. Oh my gosh this is darling! I would love to make something like this for Christmas and I think I just might. Love the candy cane handle idea! Now I need to figure out how to make it molten so it can really be drank like a hot cup! Those are such great cupcakes for a Christmas gathering. The frosting and canes make it a real treat that looks so good. Now this is my favorite I am drooling by just looking at it. What I like in a cupcake is the texture a little bit of moist and the flavoring. What a cute cupcake idea. We could totally add this to the cupcake decorating station at the church’s upcoming WinterFest. The kids would love it. These are the best cupcakes ever! I can’t think of a better flavor for this time of year that hot chocolate! This is the kind of tasty treat I crave this time of year. The presentation is just too cute! This is such a dreamy winter cupcake recipe! I love the addition of the candy cane to make it perfect for the holidays. These will be the perfect treat to make for my daughter’s dance holiday party next week! Super cute! Oh, these are so freaking cute. And they sound like they taste delicious too. Those look amazing! What a great idea. I’m going to have to make them with my girls this year. Completely adorable, Robin. I am going to make these for a tea I am going to. I know they will be a hit! These look super festive and cute! I know my kids would totally eat a couple each! These cupcakes are super cute! I love the handles…lol!! I am always obsessed to chocolate cupcakes these are really attempting! Such a perfect treats for this coming holidays. These are adorable! I love the little candy cane handles. My daughter would go nuts for these. These cupcakes are super cute. I would love to make them for my family this weekend. These are really amazing holiday treat! My kid loves decorating cupcakes. I love that this one is so easy to make that anyone can make it. Looks great! Both cupcakes and Hot Chocolate are a personal favourite. So the hot chocolate cupcakes are something that I have fallen in love with. They look really amazing too, would love to eat them and have them too. These look like such a fun idea! Will have to do these for our Annual Cookie Party. I had no idea there was marshmallow flavored frosting! I feel like my horizons have been spread wide open! Those are the cutest cupcakes! I’m so going to make these with the kids this weekend. These look incredibly delicious! It’s been years since I’ve made cupcakes – need to remedy that! I like baked goodies but I am not fond of baking lol. These looks absolutely decadent, I want one. Yum these sound perfect! I love hot chocolate and cupcakes so it’s perfect for a nice treat for me! Those are super cute, and I bet they taste good too!